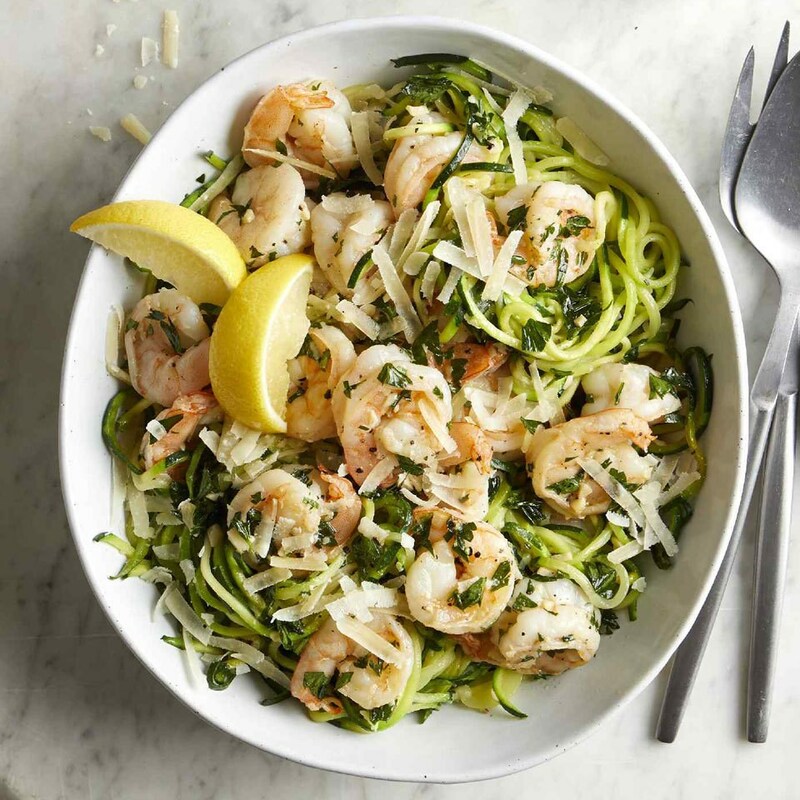 Fresh zucchini noodles, or "zoodles," are a popular option for low-carb pasta dinners. Learn how to make and cook zoodles without them turning soggy. Zucchini noodles, or zoodles as they're commonly called, are easy to make, inexpensive and have a fairly neutral flavor. That means they work in dishes from spaghetti to pad thai, Alfredo to beefy stir-fry. 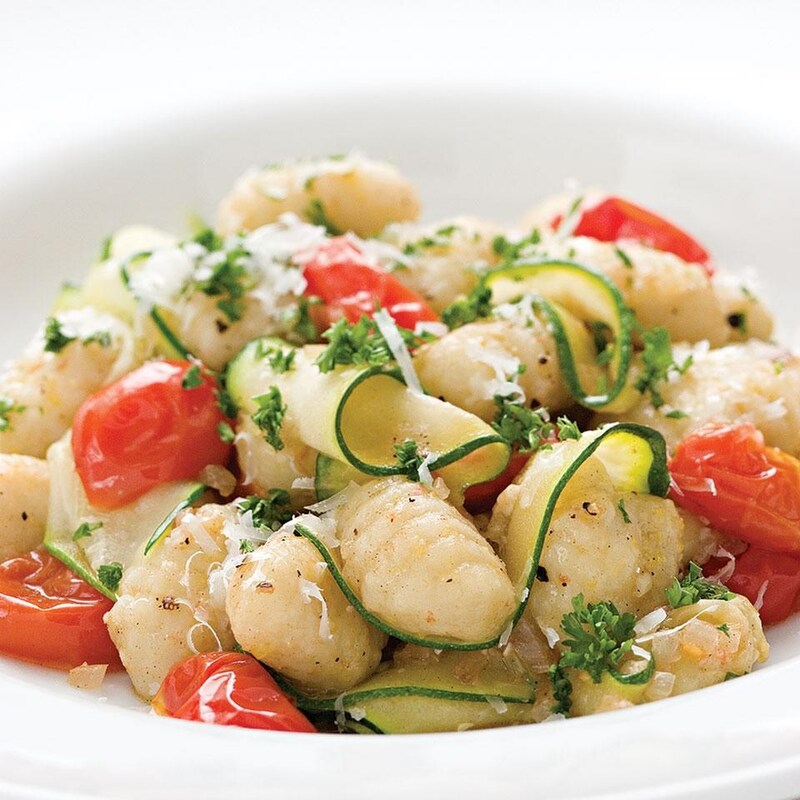 They're quite versatile, and they're a healthier alternative to traditional white pasta, too. 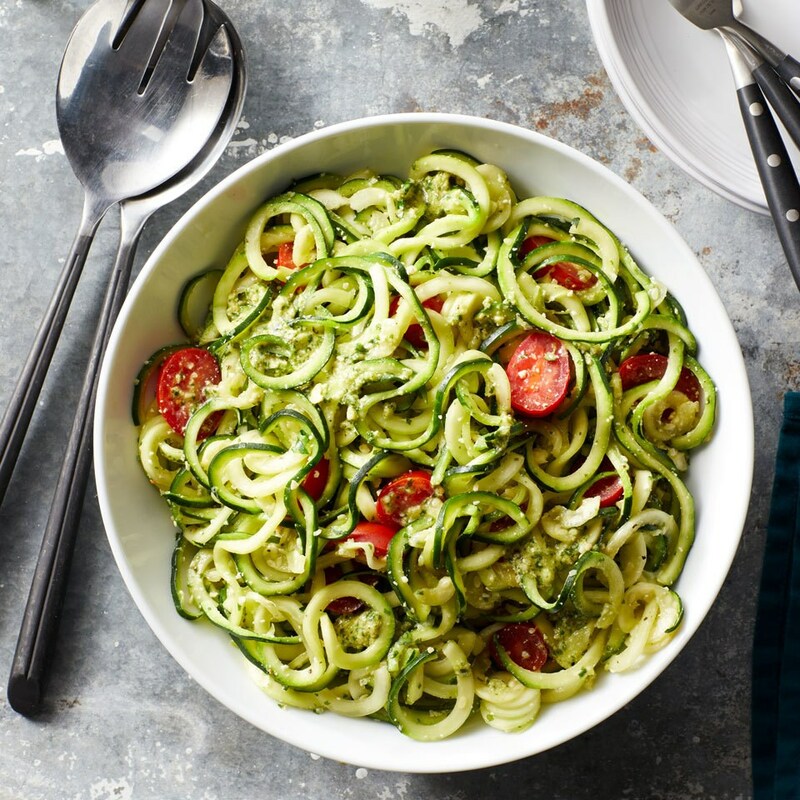 Raw zucchini noodles are made by spiralizing, slicing or peeling fresh zucchini into thin strands or ribbons. Some zoodles are slender and thin like spaghetti; others may be flat and broad like pappardelle, even lasagna. Zucchini noodles are often used in place of traditional flour pasta with sauces like marinara, pesto and Alfredo. They can be added to dishes such as stir-fries or quiches to cut calories and increase the filling factor. They can even be stirred into soups at the last second to become delicate, silky "noodles." Small or medium zucchini are better for making zoodles. Large zucchini have watery cores filled with seeds. Spiralizers are specialized kitchen gadgets that can turn vegetables into strands of noodles. In addition to zucchini, you can use a spiralizer with sweet potatoes, beets, carrots, butternut squash and more. However, if you don't have a spiralizer, don't worry. One of these alternate techniques can help you get your faux noodles in no time. 1. Rinse and dry small or medium zucchini. Trim off the ends. If you prefer, you can also remove the peel. 2. Secure the countertop spiralizer to your counter with suction cups. 3. Hold one zucchini parallel to the counter, and place one end of the zucchini against the blade of the spiralizer. Slide the vegetable grip onto the other end of the zucchini, and press gently to hold the zucchini in place. 4. Turn the handle or rotate the zucchini with your hand against the blade to make noodles. 5. Use kitchen shears to cut the zoodles into 3- to 4-inch lengths. Discard the zucchini core, or freeze it for use at a later time. Handheld spiralizers are smaller than countertop versions, but they work well for quick meals. 1. Rinse and dry small or medium zucchini. Trim off the ends. You can remove the peel if you don't like the zucchini skin. 2. Hold the spiralizer in one hand and a zucchini in the other. 3. Place one end of the zucchini against the blades of the spiralizer. Twist the zucchini against the blade. Zoodles will emerge from the other side of the spiralizer. 4. Cut the zoodles into 3- to 4-inch lengths with kitchen shears. This will make eating the zoodles much easier. A vegetable peeler is compact and used routinely in a busy kitchen, so you likely have one in your kitchen drawer already. 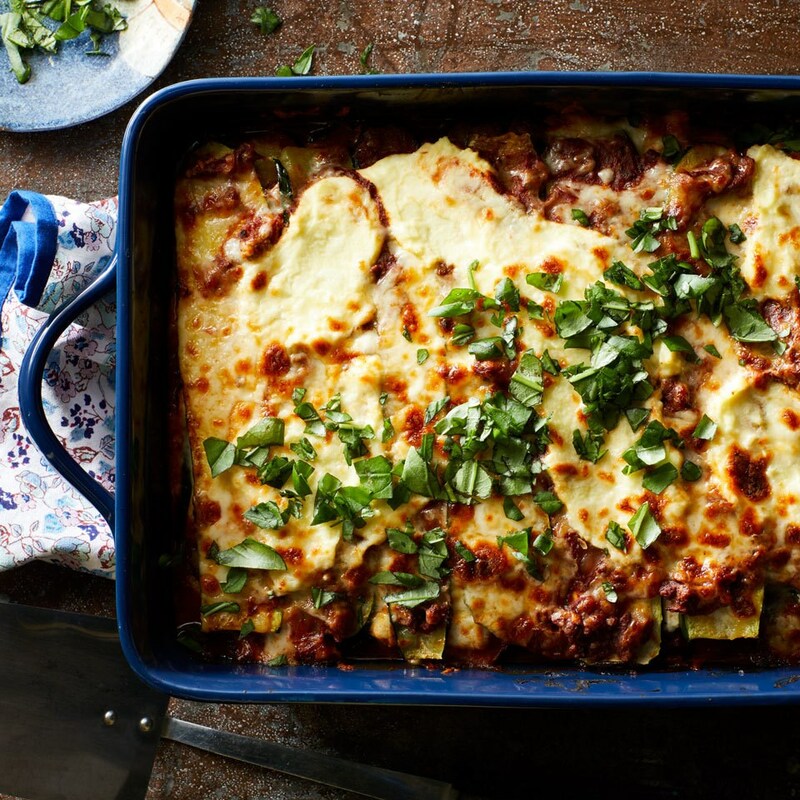 This method is more time-consuming, so it's ideal if you're only cooking for one or two people. A straight vegetable peeler will produce broad, flat noodles. A julienne peeler has serrated blades, and it will make long threads of zucchini. Pick the one that works best for your final dish. 1. Rinse and dry small or medium zucchini, and trim the ends. 2. Cut a zucchini in half lengthwise, and place cut-side down on a cutting board. 3. Run the peeler lengthwise across the zucchini to create strands or noodles. When you reach the watery core, stop. 4. 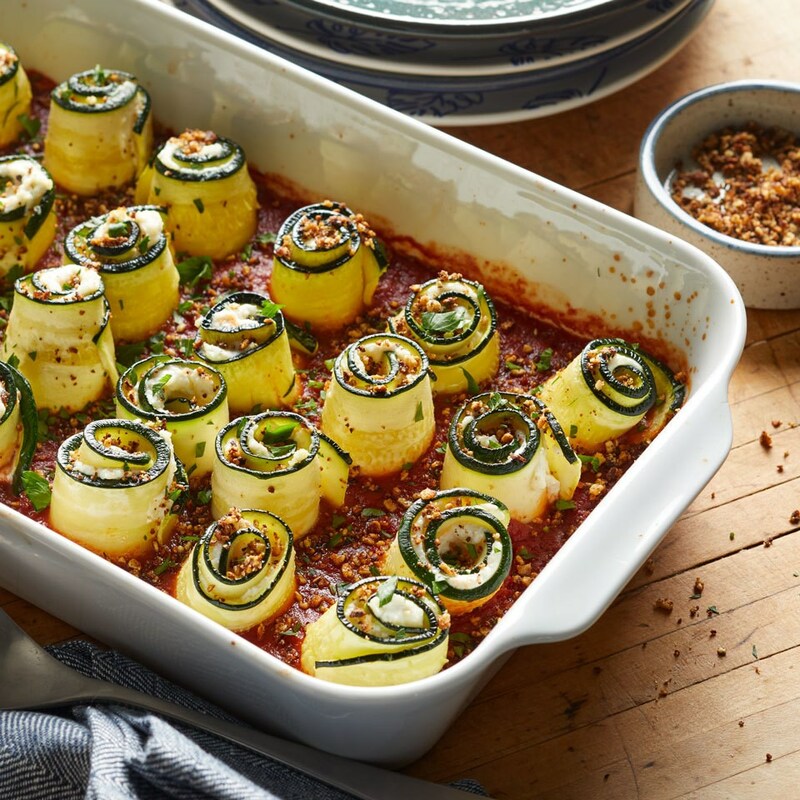 Repeat these steps with the other zucchini half. A mandoline is a food-prep tool that slices, juliennes or cuts vegetables with ease. It's frequently used to cut potatoes into fries or chips, thinly slice apples for chips or shave cabbage for slaw. It can also be used to turn zucchini into noodles. Mandolines have flat blades for broad noodles. They also frequently come with julienne blades for long strands. Pick the one that's right for your final dish. 1. Wash and dry small or medium zucchini. Trim off the ends. 2. Place the prongs of the vegetable grip into one side of a zucchini. Place the zucchini on the mandoline. 3. Using the vegetable grip to guide it, slide the zucchini along the blade. The noodles will come out below the mandoline. Remove any pieces that are watery or filled with seeds. You'll need your best knife skills to turn zucchini into slender strands. However, it can be done. This method, like the peelers and mandoline, will produce straight noodles, not spiral ones. 1. Wash and dry small or medium zucchini, and trim off the ends. 2. Cut a zucchini lengthwise into quarters. Remove the watery core with seeds. 3. Slice one quarter carefully into thin strands. Repeat with the remaining quarters. The first step when cooking zucchini noodles is guaranteeing they won't become soggy when you put them in the pan. These steps will help prevent watery, soupy zoodles. 1. 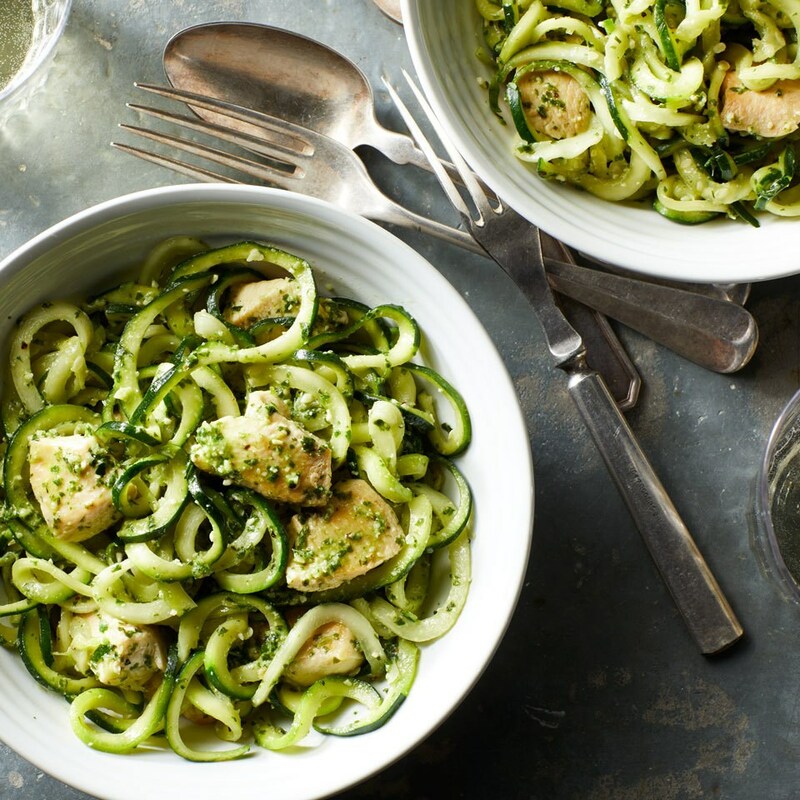 Once you've spiralized or cut the zucchini noodles, place them in a colander in the sink or over a bowl. 2. Sprinkle with 1/2 teaspoon salt and toss well. 3. Let the salted zoodles stand in the colander for 15 to 30 minutes. 4. Squeeze the zoodles gently to release excess water. Do not oversqueeze them, as the zoodles can turn mushy and soft. Once you've squeezed the zoodles dry, you're ready to cook them. These two methods can create al dente zoodles easily. 1. Heat olive oil in a large nonstick skillet over medium-high heat. 2. Add zoodles to the pan and sauté, stirring or tossing with tongs constantly. Cook until tender, 3 to 4 minutes. 3. Remove the zoodles from the pan to prevent additional cooking. You can skip the salting and squeezing steps if you choose to bake the zoodles. 2. 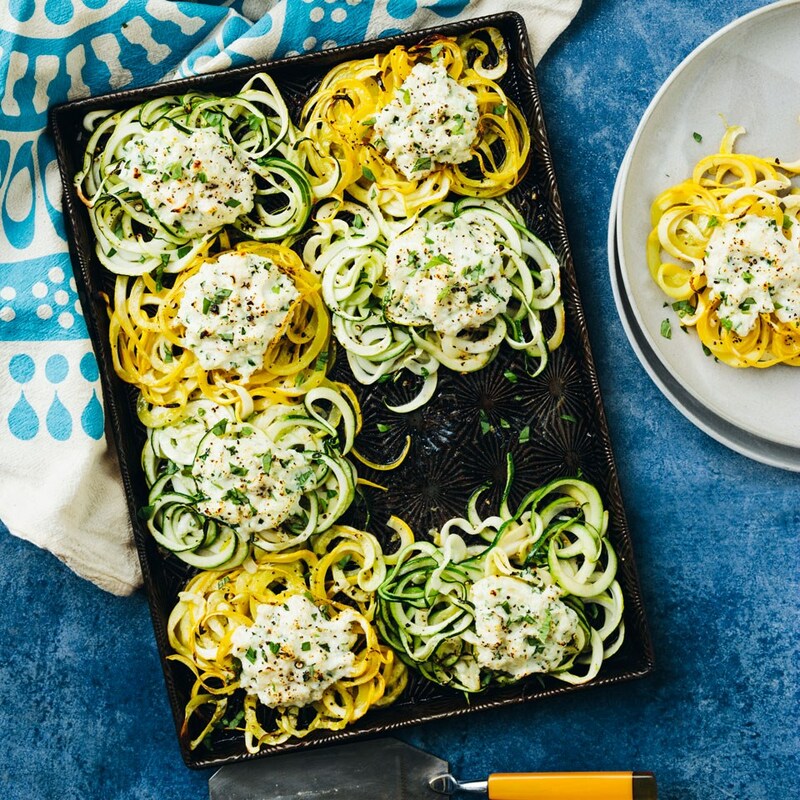 Once you've spiralized or sliced the zucchini noodles, place them on a large baking sheet. 3. Place the pan in the preheated oven; bake for 15 minutes. 4. Remove from oven and pat dry. You don't have to cook zucchini noodles before you eat them. You can enjoy them raw in a salad or cold "pasta" dish. When it's sliced into thin noodles or shreds, zucchini is toothsome but not tough. For the simplest dish, toss cooked zucchini noodles with your favorite sauce. Vodka, marinara, Alfredo and pesto are great options. 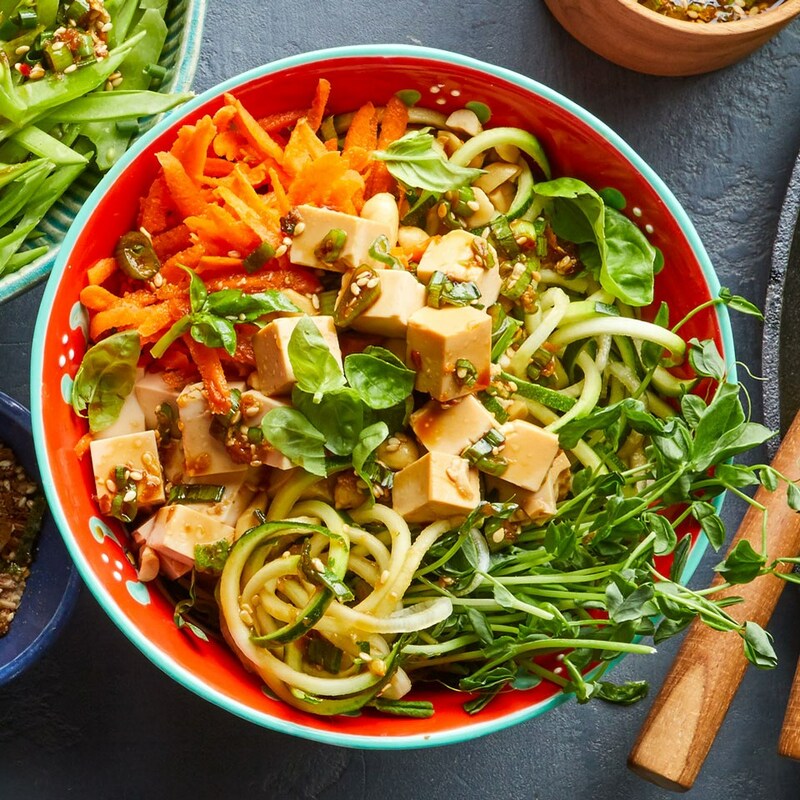 Use zucchini noodles to add bulk to dishes like stir-fries or pad thai. 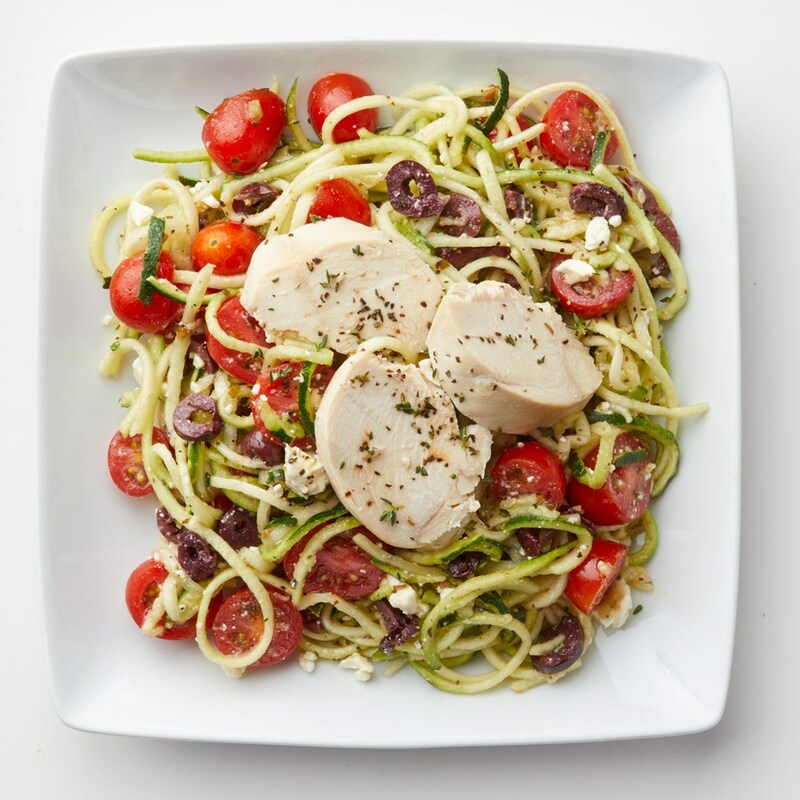 Zoodles don't add many calories to a dish, but they do add a lot of filling fiber. Use zucchini noodles as the base of a simple brunch frittata. Pour a mixture of eggs and milk over the spiralized noodles, top with cheese and bake. 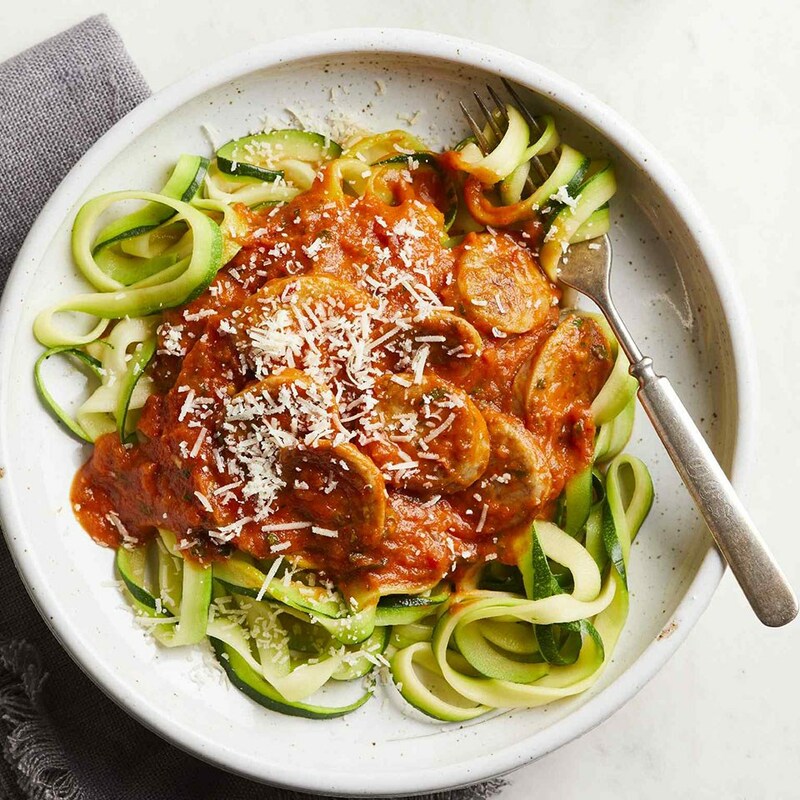 Zucchini noodles are a low-carb, low-calorie and gluten-free alternative to traditional white-flour pasta. 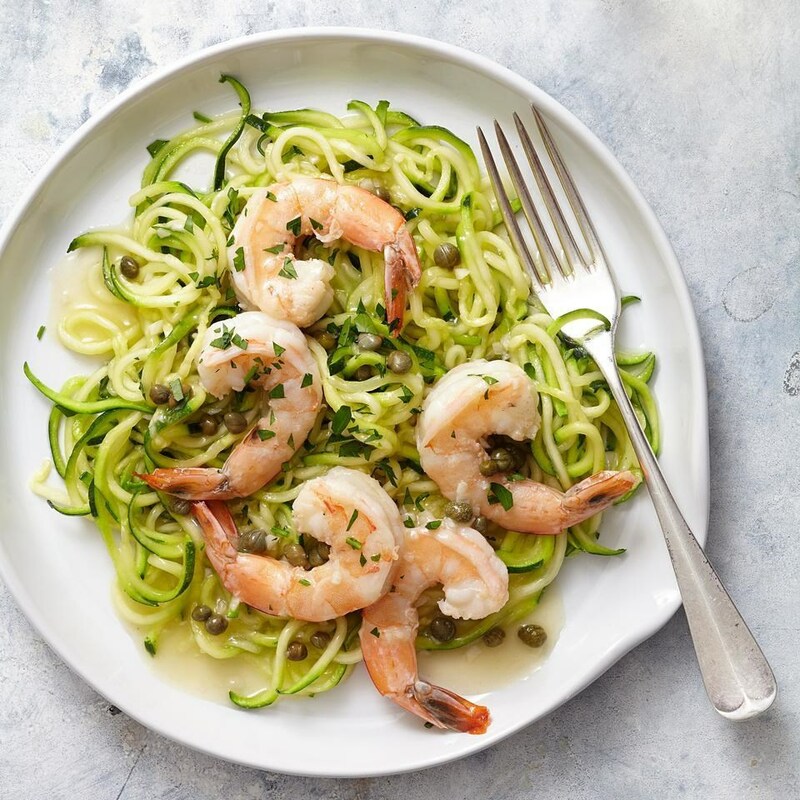 One cup of white pasta has 200 calories and 40 grams of carbohydrates, but 1 cup of zucchini noodles has about 25 calories and just 5 grams of carbohydrates. 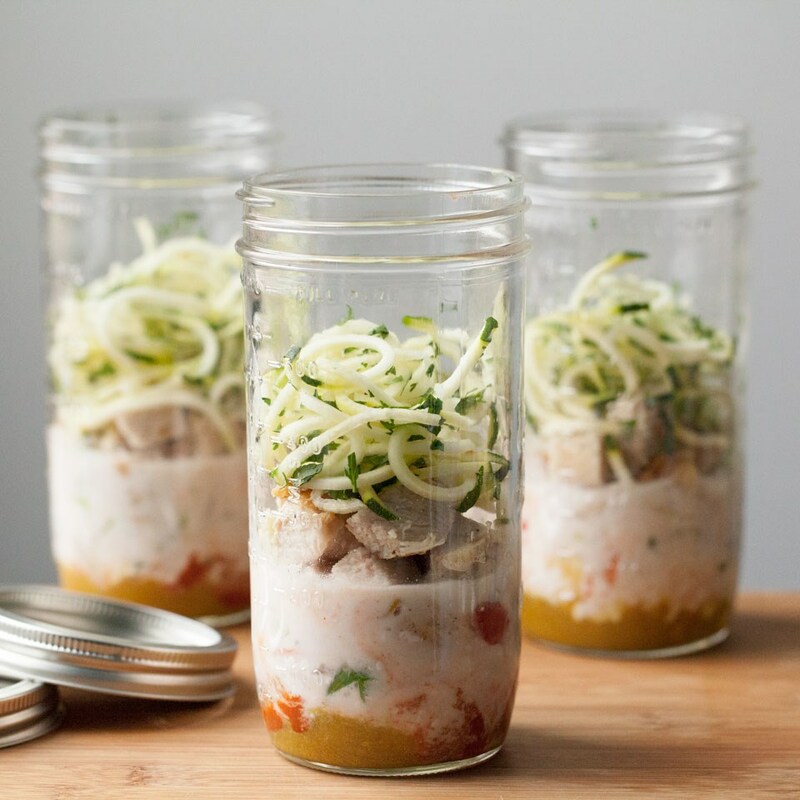 Plus, zucchini noodles serve up vitamins A and C and fiber.